What Dog is Right for Me? A wealth of information about the breed we love including history, traits, breed standards, training, health, and more. 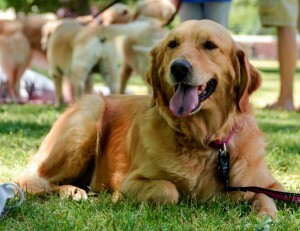 The Foundation was established to promote the public’s knowledge and appreciation of dogs in general and Golden Retrievers in particular; to further understanding of the diseases, genetic defects, injuries and ailments afflicting dogs; to promote the development of information related to the proper care, treatment, breeding, health development and training of Golden Retrievers; and to foster and promote the rescue, rehabilitation and placement of displaced Golden Retrievers. The Golden Retriever Foundation April Fund, Pagey Elliott Education Fund, and Rescue Fund have supported activities of Homeward Bound over the years. In the area of research they are activity supporting studies across the country on canine cancer. Hip dysplasia is an inherited malformation of the hip joint, where the head of the femur does not fit snugly into the pelvic socket. It is common among most large breed dogs. There are varying degrees of severity of hip dysplasia. Dogs with milder cases can live long, happy, normal lives, but some will require surgery. Some dysplastic dogs show no signs of the condition until their later years when muscle tone begins to deteriorate and arthritis becomes more prominent. Severe arthritis can result from hip dysplasia. Like hip dysplasia, elbow dysplasia is an inherited condition of young dogs that causes the elbow joint to develop improperly. Symptoms may not show up until later years. Less common than hip dysplasia, it can be difficult to diagnose and can cause increasing lameness and pain in affected dogs. Hereditary cataracts, which manifest themselves with opacity in the lens of the eye, are a common eye problem in Golden Retrievers. Some hereditary cataracts generally appear at an early age, and while they may or may not interfere with the dog’s vision, some do progress into loss of vision. Eyelid and eyelash problems are also common in goldens. They can be hereditary, and caused by other factors. Entropion and ectropion are the turning in or turning out of the eyelids. These conditions involve eyelashes or hairs rubbing on and irritating the eye. Surgery may be needed to correct these problems. Arthritis is common among Goldens, and it often affects dogs much the same way it affects humans. Movement becomes more difficult and is often extremely painful. Treatment may include injections for pain relief and some medication that can be administered at home. Cancer is a killer for many species. Sadly, cancer is now the #1 killer of Golden Retrievers. Golden Retrievers are most likely to face hemangiosarcoma (cancer of the blood) which commonly affects the spleen, liver, heart and skin, or lymph sarcoma (cancer of the lymphatic system). Allergies are a common affliction in Goldens. The ears, skin, nose and other parts of the body can be affected. Identifying the cause of the allergy can be difficult; often it is a question of a reaction to something in the dog’s environment. Flea allergy dermatitis is also a major problem with many dogs. This condition is caused by a twisting of the stomach and thus trapping the stomach contents and gases, resulting in a rapid swelling of the abdomen, accompanied by pain and eventual death if untreated. It is a top priority emergency which requires immediate veterinary attention. It is condition most common in large, deep-chested breeds. Hypothyroidism, an insufficient production of thyroid hormone caused by disease of the thyroid glands, is a common health problem for golden retrievers, and is usually identified by chronic and recurring skin problems. It is easy to diagnose with a simple blood test. This condition is very easily treated, but treatment usually must continue for the rest of the dog’s life. Copyright © 2018 Homeward Bound Golden Retriever Rescue & Sanctuary, Inc.